With just a few essential ingredients, the artisans of this most Japanese of drinks have skillfully managed to create an amazing variety of sake. Whilst at first glance the classification system may appear a tad bewildering, it doesn’t take long to learn the names of the main categories. Knowing which category a sake falls into can help you make an informed choice when facing the drinks menu, understand what flavours to look out for, the recommended temperature to drink at, and a little bit more about the ingredients. 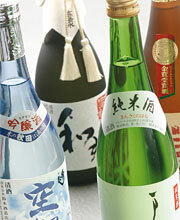 Around 75% of the total volume of sake available is known as futsushu or ‘regular sake’, and varies a lot in quality. The remaining 25% or so is known as tokutei meishoshu, in this case ‘special designation sake’, which is generally regarded as premium sake. Sake in this category is given one of a number of ‘special designations’, which mostly depend on variations in the production process of the drink. Rice is of course the essence of sake, but the extent to which the grain is actually processed is different depending on the type of sake produced. As the outer part of the rice grain contains impurities which can impair the taste of the drink, this outer part is milled away during processing. With more of the rice grain milled away, the quality of the sake increases, but so too does the cost, as more of the grain is discarded. The percentage of the grain that remains after milling is known in Japanese as the seimaibuai, so a sake that has had 40% of its rice grain milled away will have a seimaibuai of 60%, making it a premium product. Another key factor in categorising sake is whether distilled alcohol has been added to the drink. Whilst regular sake can have quite a high percentage of added alcohol, for a premium sake only a small amount of this distilled alcohol, known as ‘brewer’s alcohol’, can be mixed in, if at all (a junmai categorised sake for instance, will have no added alcohol).